It’s the last Friday of the month, so that means it’s time for the Lawnscaping Challenge Facebook Inspiration Team’s (FIT) Monthly Blog Hop! You’ve probably arrived from Sabine‘s blog, but in case you’re starting here, you’ll find the full hop list at the bottom of my post! 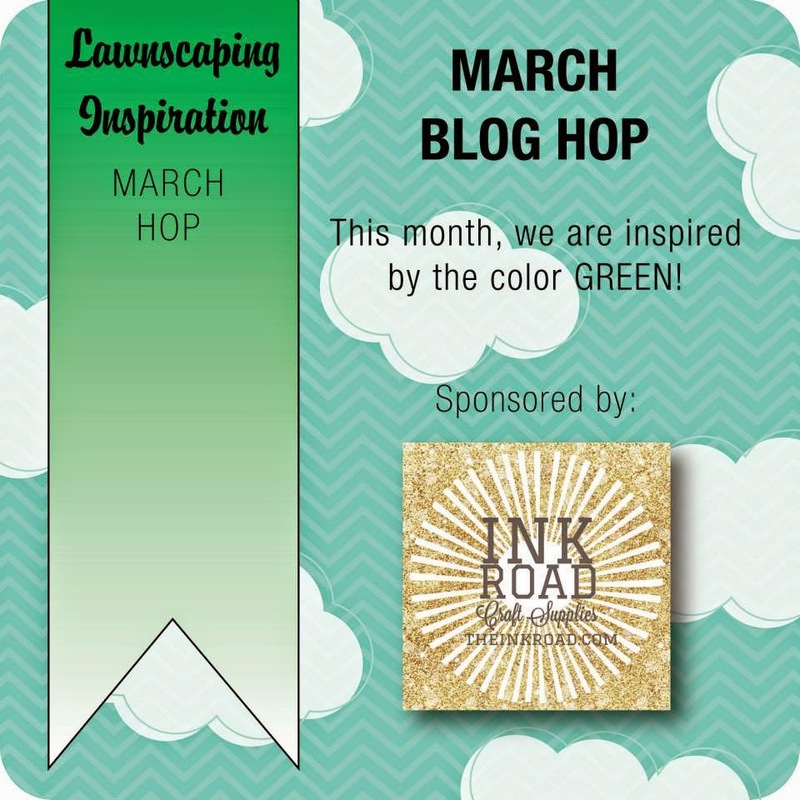 This month’s hop is being sponsored by The Ink Road! Be sure to visit The Ink Road and Lara’s blog! We’ll be picking a winner from all of the comments left on our hop to receive a gift certificate to The Ink Road! 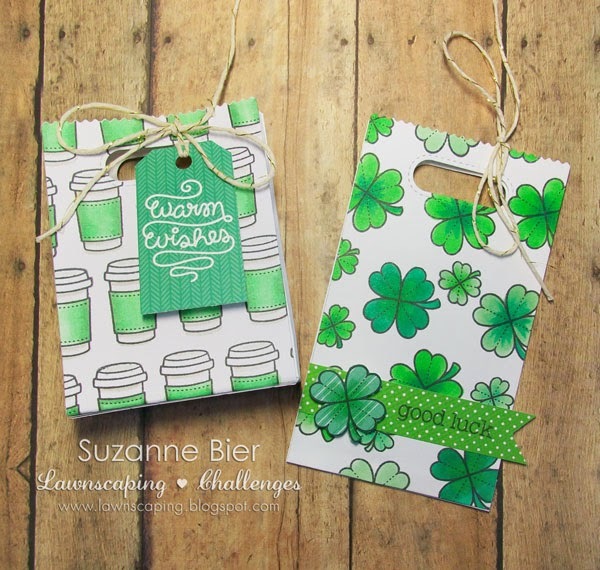 This month, the FIT is inspired by GREEN, so I made a mini gift bag and a gift card holder with Lawn Fawn’s “Love You A Latte” and “My Lucky Charm” sets. I made both the gift bag and the card holder with the Goodie Bag Lawn Cuts die. I made the custom paper by stamping patterns on white card stock and coloring the images. Before you continue the hop at Marina‘s blog, be sure to leave a comment for me so you can increase your chance of being the lucky winner of a gift certificate to The Ink Road! It’s no joke! I’m launching a new blog on April 1! Like the green gift bags. I must have “My Lucky Charm” sets. Beautiful projects.Thanks for chance to win! What an adorable set! I love your coloring! Love your mini gift bag and gift card holder… perfect for St. Patrick's Day or a March birthday (like mine!)! This is so ADORBS! You really need to come check out Anya, Oddies, and Others! We are all about stamps, any brand, but we do have a dedicated page for LawnFawn and SOG! Come link up and share your inspiration with other stampers! These are so darling!! Love all of the stamping! what great bags! great creations! Oh my gosh I love those! Perfect for gift giving! Your gift bags are amazing!!! Super LOVE. I finally broke down and bought that goodie bag lawn cuts. Thanks for the SWEET inspiration! Awesome goody bags!! Definitely captured the green inspiration!! I love that goodie bag! Great inspiration! oh wow are these treat bags/boxes fantastic! Clever!!! Ahhh! Love these little bags! So cute! Oh my, what fabulous custom paper you created. Great projects! Great idea to make the gift card holder. I'll have to case that one!